I read The Lost Men while I was pregnant. My pregnancy was a particularly vomit-y experience. I wrote this review in the first 3 months of parenthood, which was an equally vomit-y experience. So I fear that I may not have approached the story in my clearest mind, and therefore may not have appreciated it fully. Whatever impression I give you of The Lost Men, elevate it by about 3 notches to get a more accurate representation! The Lost Men is an allegory about fate. It poses the question, to what degree are we in control of our destiny? and, more interestingly, what difference does it make when this question arises in the reality of family life instead of in the realm of philosophy? The Lost Men is thought provoking, if somewhat one-dimensional. It addresses complex ideas about destiny in a digestible form, but without much playfulness, seeming to take itself too seriously. The characters are obvious personifications of concepts. The main protagonist, symbolically named Mann, represents knowledge and isolation, and his female counterpart, Faith, represents experience and adventure. Mann and Faith are destined to be together and they have been assigned counsels (guardian-angel type prophets) to guide them on their respective journeys to find each other. Mann’s counsel, Joy, provides him with wisdom from a distance whereas Faith’s counsel, Paine, is a closer ally. I’m sure it’s possible to write a GCSE-style essay on the significance of these names and their relationships, seeing as it’s not too deep or profound. Mann and Faith live in a post-apocalyptic dystopian future where the population has largely been destroyed and there is a constant threat from, and fear of, the Lost Men, who have chosen to reject their counsel to live lawlessly in the shadows, killing and destroying other signs of life. The desolation that Mann and Faith inhabit is a consequence of the previous generations’ destructive lifestyle; Colon is sending a clear message to the reader on the dangers of our current lifestyle…cue another GCSE-style essay. The most enjoyable parts of The Lost Men were, for me, the dialogue between the characters, but unfortunately conversation is lacking in the majority of the tale. Instead, there are long and dense abstractions while Mann mulls over his thoughts in isolation. It’s only when Mann and Faith finally meet and begin their life together (which is at the end of the story) that things start to get interesting. Gripping, in fact. I think I found the ending most interesting because I like the human-factor; the emotion and depth of connection between the characters, and this only comes to the fore at the end. Prior to this, The Lost Men is largely an academic pursuit which is readable, but lacking in warmth and sentiment. 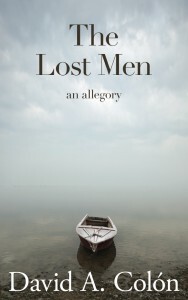 The Lost Men would be a perfect read for a philosophy student because it brings the theoretical complexities surrounding the idea of fate to life by applying them to a family context.